Things by Cultured Code are hands down the best task management application ever designed and developed that I’ve ever tried. Things 2 introduced Cloud Sync that essentially synced your tasks, projects, areas of focus, and notes across you Mac and iOS devices. Cloud Sync I think works even better than Apple’s iCloud because of how smooth the syncing is between devices, but that is just my personal opinion. 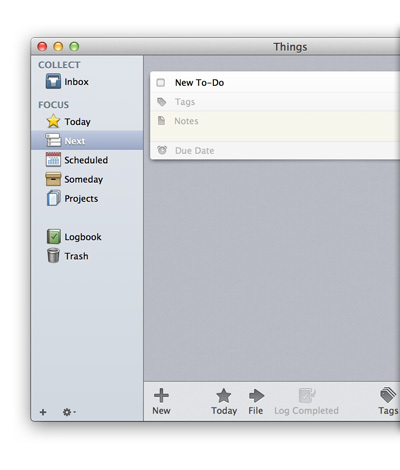 Things has a centralized inbox box where you can place unsorted tasks that can be later be focused on. Things has an area to focus on tasks on the sidebar where you can assign tasks to start today, next, scheduled, someday or projects in general. I have been unsuccessful in pushing my calendar appointments with things or vise versa. I remember in version 1 you could sync iCal on your Mac with Things, but the features has faded away in this version. You can find people in the support forums bringing it up, but as of right now I couldn’t get that to work properly. If I do get that working correctly in Things to sync with iCal I will post it here as an update for the post. Things has a dedicated active projects area, which you can create projects for different things relating to general things to very specific things like if you need a tasks to have sub tasks I usually make an active project of that task and go from there. You can also take these active projects and place them in areas. I use areas to place all my projects and tasks to be divided between work, home and personal errands. You can also do this with tags, but I find this be more effective. The Mac and iOS devices are designed to be consistent and work united. I have used every task management app you can think of from the of your head from OmniFocus, Todoist, Remember The Milk, Google Tasks, Asana and the list goes on, but by far Things is hands down a win in my book. I have not been paid by the developer to say this at all, which I like to make note of, but this is my honest opinion about Things for Mac and iOS. Things isn’t perfect just to make things clear it has pros and cons like any other piece of software. Things can’t be perfect and you’re right, its not. It has a few things I wish were better like the integration with Reminders on OS X and iOS has geo-fence support, but Things doesn’t seem to take advantage of that feature. One feature I would like to be added that would be sweet is to add the ability to add maps and attachments to tasks or integrate with Dropbox or Box services. Overall I give Things a 9 out of 10 for being one of the best task management apps out there, and the team in Germany at Cultured Code is doing a great job.